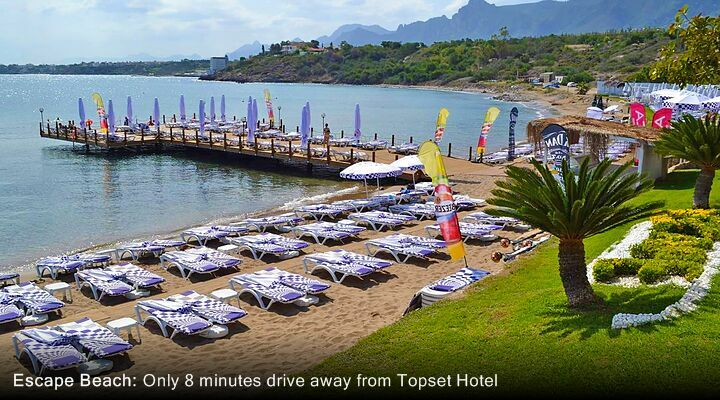 Set down a side road off the main street in Karaoglanoglu, the Topset Hotels enjoy uninterrupted views from their private beach and seafront terrace, perfect for those who want sun, sand and sea all on their hotel room doorstep. 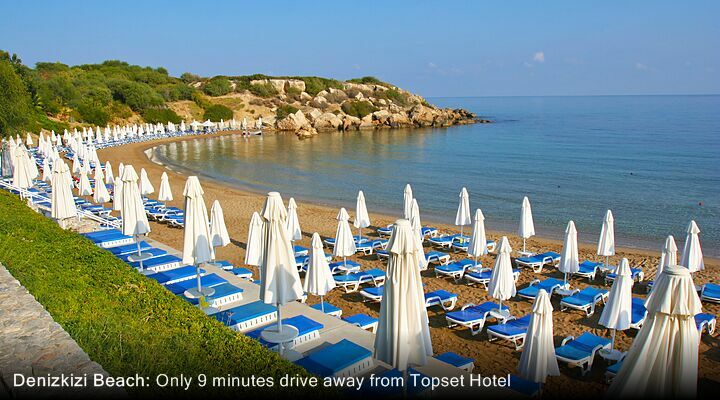 With their own sheltered beach and uninterrupted sea views, the three sections of the Topset Hotel really are set in a lovely position on the North Cyprus coast. Whether you want to swim in the pool, sunbathe on the beach or relax under the shaded seafront pergola, the sparkling Mediterranean Sea is just a few yards away, shimmering in the Cyprus sunshine. 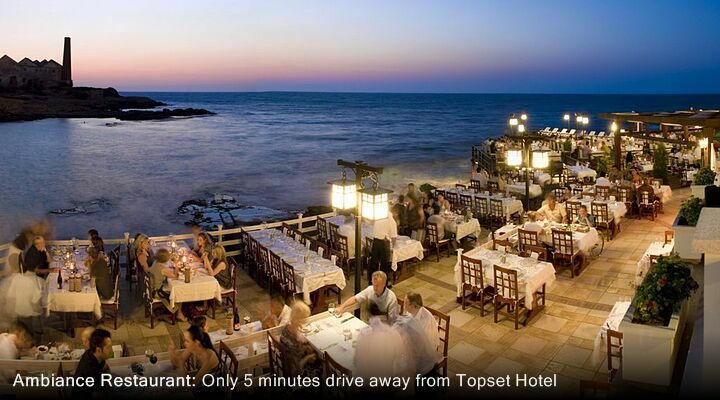 At the Topset Hotel, you can choose the right amount of space you want on your North Cyprus holiday. The garden studios with a private terrace are perfect for couples, while the galleried family rooms have more space for the kids. 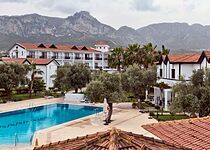 The elegant hotel rooms include a lounge area and balcony, for admiring the excellent sea and mountain views. All are decorated in traditional Cypriot style with wooden beams and rustic style furniture, plus all the facilities you’d expect in a 3 star hotel including air conditioning, TV, en-suite bathroom and mini bar. The Topset Hotel swimming pool is surrounded by rich planting and tall palm trees, so you fees like you’re swimming in a little oasis! There is a hexagonal children’s pool separated from the main pool by an ancient stone fountain, and plenty of sun loungers and umbrellas to shield you from the strong midday sun. From the pool it’s literally just a few steps to the seafront terrace, and the beach beyond, so you can move from pool and beach within a minute. The free hotel wifi also reaches to the pool area, so you can check your emails after a swim! Enjoy an al fresco buffet breakfast at the Terrace Restaurant under the shaded shady bamboo pergola, featuring home made jams and dates from the hotel’s own garden. 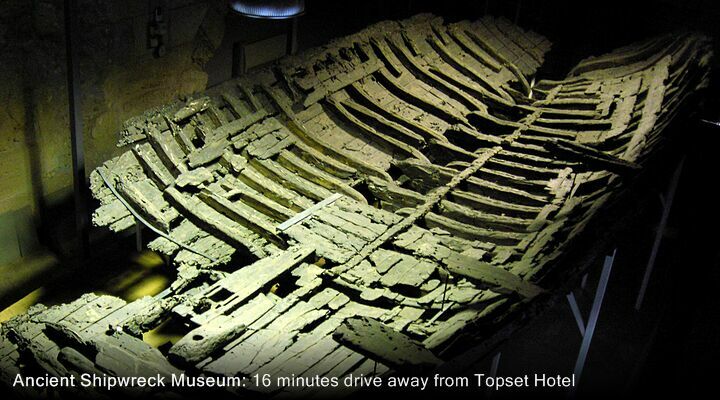 In the winter, snuggle up around the fire in the Lobby Restaurant, perfect after a day’s sightseeing. Both restaurants are open all day and for dinner serving local dishes, snacks, and that kids’ holiday essential - ice creams! Indulge in a pre-dinner cocktail at the beach bar, or watch the moonlight on the water with a late night drink. The hotel lobby bar is decorated with cane furniture and straw hats for a quirky, friendly feel. With food and drink on tap all day long, it’s understandable that the hotel operates a strict ‘no food or drink from outside’ policy. 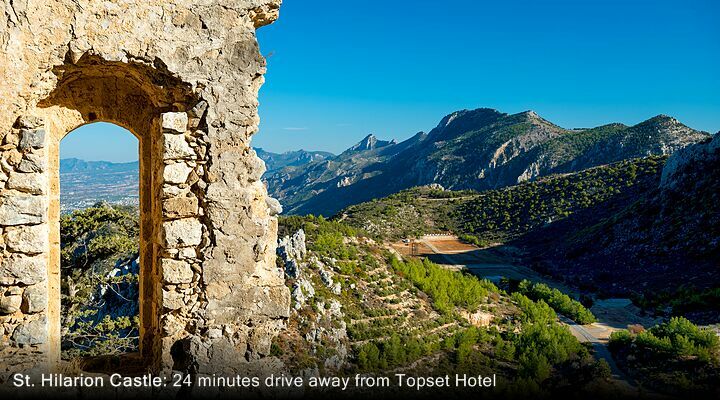 The Topset Hotel has created its own charming little sandy beach set in the shelter of a rocky promontory. Relax on your sun lounger with a book from the hotel’s library, shaded from the sun by an umbrella, and with a refreshing drink from the beach bar. There are also open air showers available so you can rinse off the sand after a swim. 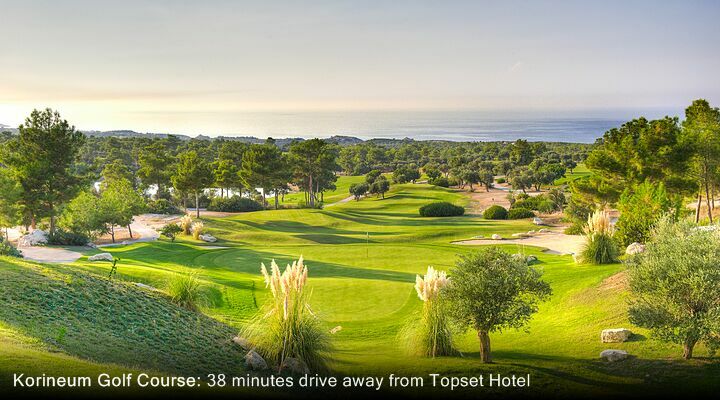 The Topset Hotel offers a wide variety of excursions and activities, so you probably won’t need a hire car. 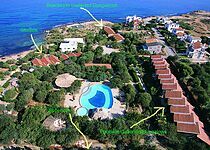 The nearby horse riding club is very popular, as re scuba diving lessons and boat tours along the coast. 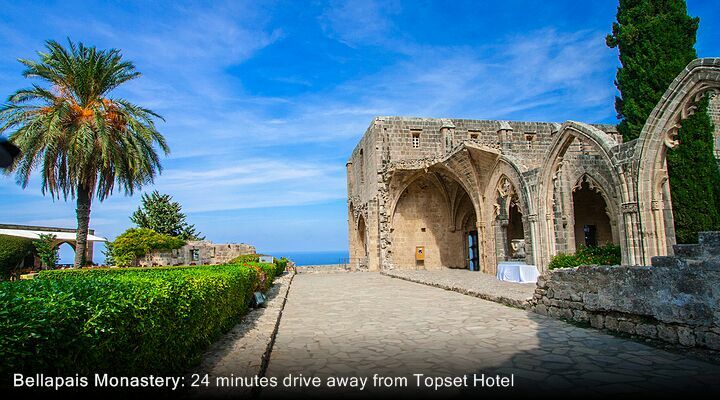 The local dolmus (bus) runs into Kyrenia from the main road, just five minutes up the lane from the Topset Hotel. The hotel also welcomes yoga practitioners, personal development coaches and spiritual guides, many of whom offer workshops at the hotel. You might also come across a wedding celebration, as ceremonies are regularly held in the hotel’s little amphitheatre. 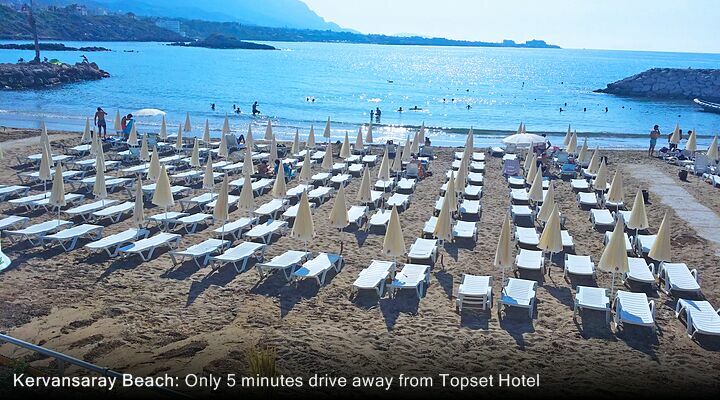 When you book the Topset Hotel, you could be from plane to poolside in under 90 minutes, as Ercan International Airport is just 45 minutes' drive away. 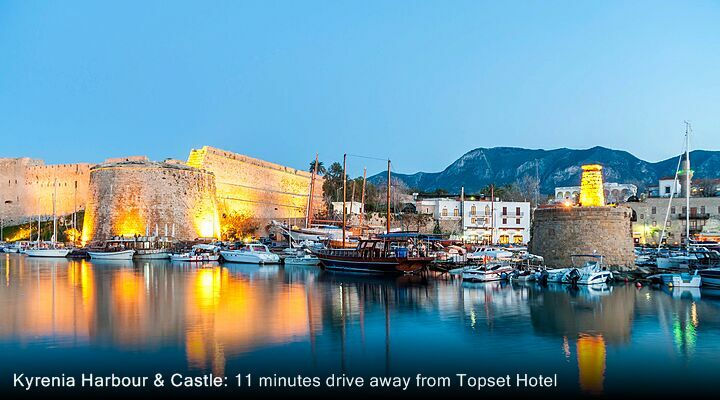 Scheduled flights to Ercan Airport North Cyprus are available from several UK regional airports.